The Smoke Joint in Fort Greene, Brooklyn closed this week after 12 years of slinging good BBQ. The Smoke Joint, a quality barbecue restaurant in Fort Greene, Brooklyn, closed its doors this week after 12 years of slinging good ribs, wings, pulled pork, and other smoked meats. A lot has changed in NYC BBQ culture since The Smoke Joint opened, with more than 20 new places opening in the past 10 years. Co-owner Ben Grossman said he was happy to be part of the recent BBQ explosion in New York and that his joint was ahead of the curve. In what is likely its biggest moment in the sun, The Smoke Joint was featured on the Diners, Drive-Ins and Dives in 2013. 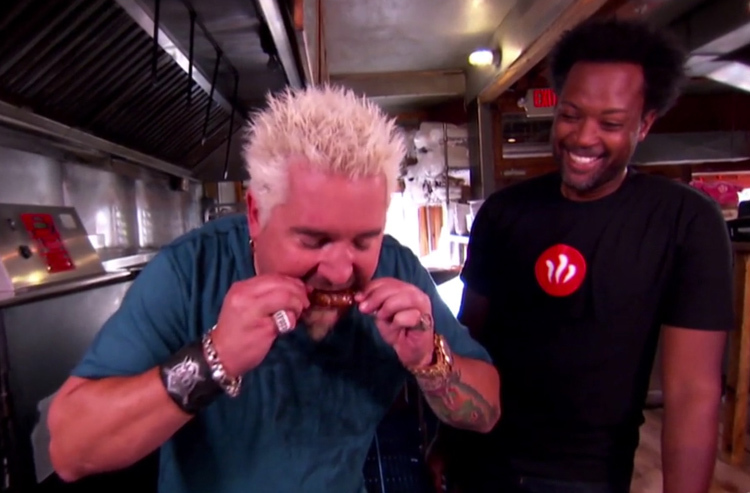 On the show, co-owner Craig Samuel showed Guy Fieri how they made their spicy wings. Guy definitely teared up from the heat. The Smoke Joint was featured on Diners, Drive-Ins, and Dives in 2013. The location that once housed The Smoke Joint will soon become a new location for Peaches HotHouse, which is run by the same owners. The original Peaches HotHouse, located in Bed-Stuy, serves excellent Nashville hot chicken and has been quite popular since opening in 2010. (The team also operates Peaches Shrimp and Crab in Clinton Hill and Peaches in Stuyvesant Heights. While The Smoke Joint is now closed for good in Brooklyn, it will live again as a new restaurant in the Catskills in spring 2019. The new version of The Smoke Joint will be located in Livingston Manor, a short walk from the Catskill Brewery. Parts of the Brooklyn restaurant will be retained at the new location. I’ll have to plan a trip to the Catskills to check out the new restaurant next year. Road trip anyone? A new national newsletter about barbecue called The Smoke Sheet was launched this week by me and BBQ Tourist. If you want to keep better tabs on national BBQ trends, news, recipes. and events, sign up now! Changes are likely in store for New York's Dinosaur Bar-B-Que. John Stage, co-founder of Dinosaur, says he has bought back majority ownership of the company and now owns 55 percent of it. Fresh Hospitality, a Southern company with investments in regional chains such as Martin's Bar-B-Que Joint, 55 South and Taziki's Mediterranean Cafe, now owns 30 percent of the Dinosaur. Eater New York writes that the new $40 all-you-can-eat Korean BBQ joint Let’s Meat is not worth it because the meat quality is subpar. Finally, Jimmy Kimmel shouted out Billy Durney and Hometown Bar-B-Que on Twitter last week while he was filming his late night show at BAM. October 27: Barbecue is coming to big screen this Saturday during The Food Film Festival at AMC Empire 25 in Manhattan. “Fire and Smoke: Texas BBQ and Beyond” will feature six documentaries about barbecue and guests will get to taste great BBQ from The Original Black's BBQ (Texas), Melt BBQ (Paris), Izzy's Smokehouse (Brooklyn), Kimchi Smoke (New Jersey), Randall’s Barbecue (New York), and more during the films. Tickets are sold out, but I hope to see you all there and I will post what I can from the event. November 18: The Brooklyn Chocolate Festival will take place at the Aviator Sports & Events Center on November 18, and it will feature samples of chocolate-covered bacon, fruits, toffee, honey, pretzels, pickles, and more. Early bird adult tickets run $10 and child tickets run $7. Buy tickets here.